...and it's goodbye to care. 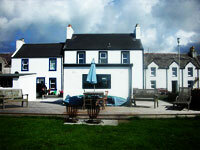 A Luxury Guest House in the heart of Islay. In this issue: Loganair inaugural Edinburgh - Islay flights , Desert Islay Discs, The continuing saga of the A83, Tartan Pimpernel's cross restored, Heroes, just for one day in Bowmore, Upcoming Doug Scott talk at IHS, Beach Rugby announces new sponsor, Bruichladdich's big plans. Lord George Robertson today (Friday 12 April) officially opened Islay's ninth malt whisky distillery at Ardnahoe, on Islay's north-east coast. Councillor Alistair Redman has voiced his anger at the lack of action and prioritisation by the Scottish Government. This follows the postponement of a special 'task force' meeting scheduled to discuss the needs of the perpetual and perennial problems of the A83, the main trunk road that serves Argyll and of course, Islay. Cllr. Redman told the Ileach "The next planned meeting of the A83 task force was due to take place on March 27, but in a letter dated March 25, George Fiddes, special projects manager with Transport Scotland, informed task force members that this meeting has been postponed and rescheduled for June 5. "The reason for the postponement is because cabinet secretary Michael Matheson has urgent committee business on March 27. This raises some serious questions. It seems that Mr Matheson and the Scottish Government, talk the talk without walking the walk. "This is yet another example of how little this central-belt, urban obsessed SNP cares about rural Argyll. Time and time again this Government has left our trunk road network underfunded and has not shown any real leadership over this matter." Cllr. Redman continued "I'm in full support of the ongoing campaign from Argyll residents and the local press alike to find a long term solution to the problems with the A83. This means the Scottish Government taking responsibility and investing large scale funding to our trunk road net work here in Argyll. "The SNP has, in the past, tried to pass on the blame for their own failing on the ferries, Police, NHS, Education and our economy to the U.K government. No doubt they will try the same with the A83, but the people of Argyll are fed up with their excuses. "The fact remains that if this was a trunk road linking two of Scotland's urban centres, it would already be fixed. This continued sidelining and indifference to the needs of rural Argyll must stop." A wooden cross given to a war hero from Islay, the Reverend Dr Donald Caskie, the Kirk minister known as the Tartan Pimpernel, has been rehung in his former church after languishing in a cellar for years. During the Second World War, the heroic Ileach helped more than two thousand allied service personnel escape from occupied France over the Pyrenees to Spain. The son of an Islay crofter, he became minister of the Scots Kirk in Paris in 1938, before being banished to Marseilles for denouncing the Nazis from the pulpit. Refusing passage on the last ship back to the UK, he ran a Seaman's Mission and was recruited by British intelligence to run one of a chain of safe houses across France. He later moved to Grenoble and continued to help soldiers, sailors and air personnel as a university chaplain, before he was finally arrested and sentenced to death by the Gestapo. However, a German pastor intervened on his behalf and he spent the rest of the war in a prisoner of war camp. After the war, he used the proceeds from his memoirs, borrowing the nickname bestowed on him by the BBC, to help rebuild the Scots Kirk. Throughout the 1950s he played a key role in an annual exchange programme between George Watson's College and Lycee Henri IV in Paris and to show their appreciation, the boys at the Edinburgh school donated three pence each to buy a gift as a token of their appreciation. Known as the 'Watson's Cross'. It hung behind the chancel in the Scots Kirk from 1959 until 2002 when the church was torn down and rebuilt. It was put in a cellar and forgotten about until former pupil Andrew Brown started asking questions about its whereabouts. It now has pride of place above a stairwell which leads to the sanctuary. Rev. Jan Steyn, who has been the minister at the Scots Kirk on the city's Rue Bayard since 2017, said he was 'delighted' that the handsome cross (8ft x 5ft) is now back on public display. "The cross was donated to the Scots Kirk during the time of Donald Caskie and it is part of the congregation's beautiful story." He explained that "For twenty years it was stacked away in the church's cellar, after the existing church was built. Our friend Andrew Brown, a member of the St Andrew's Church in Brussels, made us aware of the cross again, and we were inspired to put it up." The Kirk will also host an exhibition dedicated to Dr Caskie, including photographs, documents and his Gaelic Bible, which was donated by his nephew Tom Caskie. Some of his relatives were expected to attend a service in his honour in early April along with Melvyn Roffe, principal of George Watson's College. "It represents a really good link with the generations of Watsonians who were involved in the exchange programme immediately after the war," he said. Dr Caskie died in 1983 at the age of eighty one and he was laid to rest in the family grave in Bowmore. This year's Walk Islay event starts on Sunday 21 April, for a fantastic six days of walking across Islay, Jura and Colonsay. What's not to like? The walk leaders will be taking groups to some of the less visited corners of our beautiful islands. They can't promise sunshine and dry conditions, but they can promise magnificent scenery, fascinating archaeology and geology, plenty of wildlife and good walking company. The group will start the week on the Oa where they'll follow the cliffs back towards Port Ellen hoping to see golden eagles en-route. On the Monday, they plan to head to the east coast of Islay with a walk up to Beinn Dubh to enjoy stunning views up and down the Sound of Islay and across to Jura. Tuesday sees a choice of walks, the RSPB Oa reserve and American Monument, or they will head inland to Loch Cam and to the summit of Carn nan Gillean. They'll be heading 'overseas' to Colonsay on Wednesday (Ed Note: don't forget your passports!) to where the group we will walk to the northern end of Colonsay and discover some stunning beaches around Balnahard. On Thursday walkers will have a choice of either RSPB Loch Gruinart, or take on Islay's longest beach, the Big Strand. The programme concludes on Friday, and has become tradition, the group will head over to Jura for a circular walk south from Craighouse. The group aim to make as many walks as possible to be accessible by public transport, but where this isn't achievable, the group have set up a Facebook group 'Walk Islay Shared Transport', for walkers to share transport meeting places.